Being crossed cables, for the first time by my hand. I cannot claim that it’s the tidiest job, but it still looks pretty cool, and I’m happy to be learning a new-to-me skill variant. I’m on the last row of the pattern section, and then I have to do it another 3 or 4 times. We’ll see how much wool has gone into it after I’ve done four total. Beyond that, today was doing the work thing. 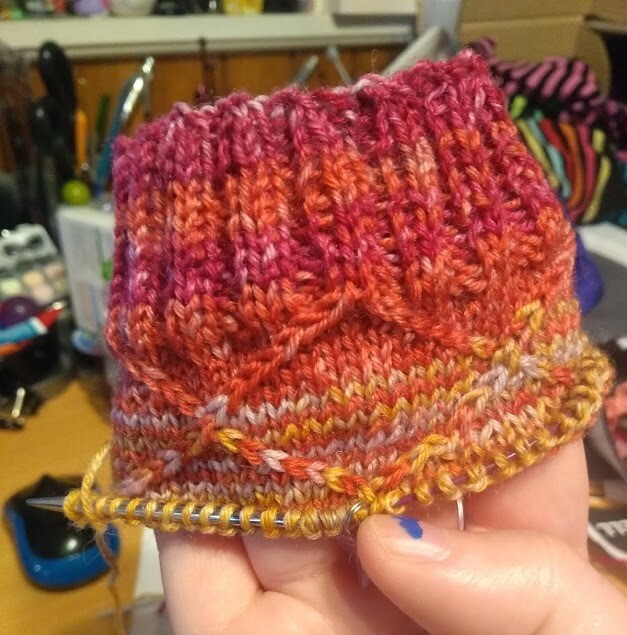 I’ve been running a bit foggy since waking up, but being nearly caught up with myself means less chance of making mistakes, which also goes for my knitting — I’ve already had to pick back one row of a cable to patch it after crossing it the wrong way.